Capote is among the 11 people I would invite for my Dinner Party with Historical Personalities. I would also like to invite Oscar Wilde, but I’m afraid it might turn out to be a very awkward meal, with the two of them competing for attention – a War of Wit! This was Capote’s first book, written in the early 40s, while he was working for The New Yorker. It reads as a sort of trial-novel and Capote must have felt it, because he later claimed to have destroyed it. The novel laid hidden for over 50 years until in 2004 it was found among some boxes left behind in his Brooklyn apartment. 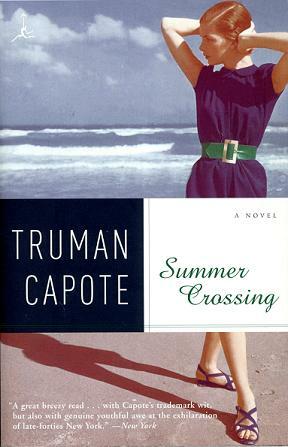 It then went up for sale at Sotheby’s, but had not bids due to the high price and because The Truman Capote Literary Trust made sure the buyer would not have the rights of publication. In the end, the New York Public Library agreed to purchase it and all papers are now part of their Truman Capote Papers. “Summer Crossing” is the story of a 17-year-old New York socialite who persuades her parents to leave her behind while they visit Europe. The reason she wants to stay is a recent love-affair with a Jewish parking-lot attendant. “What kind of things did you have in mind, kid?’ Clyde said this with a smile that exposed a slight lewdness: the young man who laughed at seals and bought balloons had reversed his profile, and the new side, which showed a harsher angle, was the one Grady was never able to defend herself against: its brashness so attracted, so crippled her, she was left desiring only to appease. And here I am reading his Christmas story. I think perhaps I need a more summery read, though, to give me hope. I am completely unfamiliar with Summer Crossing. Sounds interesting. I got it to read, I will get to it someday. But just checking, have you ever read his Christmas short story? I want to reread it NOW! I love Capote. A subdued Capote? I don’t know. LOL. Capote is one of my favourite authors and I’ve been meaning to read this for ages! I kind of expected it not to live up to his other books – I’m glad to hear it’s worth reading all the same. I’ ve never read anything of his but now I totally want to. If you ever invite him to dinner, you better invite me too, he sounds really interesting. I didn’t know he worked for The New Yorker either! Which book of his should I start with Alex? @LifetimeReader: I LOVE his Christmas Story, probably my favorite short-story ever. Have you finished it? How did you like it? @T: I knew you also had it on your TBR. I promise to wait for you next time 🙂 You’ll probably go through it in 1 hour, as it took me about 3. @Steph: I can’t either, shame on you! I think he would be a match for OW. Have you seen the movie Capote, I’m told that Philippe Seymour Hoffman played down Capote’s personality! @Ti: Give it a try anyway, even a subdued Capote is good fun! @Nymeth: I’m going for Other Voices, Other Room next. I’ve read Breakfast at Tiffany’s, In Cold Blood and some of his short stories. Anything else you recommend? @Joanna: start with Breakfast at Tiffany’s. it’s short and it will give you a flavor of Capote at his best!